We had a great long weekend just hanging out as a family of three. We took a couple day trips to look at campers (we may have found one! ), spent the days barefoot in the grass, grilled burgers + asparagus, make watermelon chillers with lime oil, and played in the baby pool with E. I'd take another weekend just like that any day. Just after Elliot's first birthday we had a little afternoon photo shoot with the talented Jamie Sapp, and I am overwhelmed with how beautifully she captured our little family. It was a fun afternoon where we just played in the fields and grass, and E had just started walking, making it even more of a fun play-filled afternoon. I love how Jamie captured those sweet little moments and brought out just how much light and love this little one has brought to our lives. One of the main reasons that I started using essential oils was that I wanted to have natural alternatives for all of the things that come with little ones. I wanted to be able to control my son's exposure to harsh chemicals in the products that we use - diaper cream, bug repellant, household cleaners, etc. There is a list of our DIY recipes here, but I wanted to share some of my other oily favorites for littles, from newborns to kids! + Lavender: truly the swiss army knife of oils, we use this for just about everything - skin support, respiratory support, relaxing + unwinding, the list is endless! I use it in our linen spray, diaper rash ointment and wipe solution. 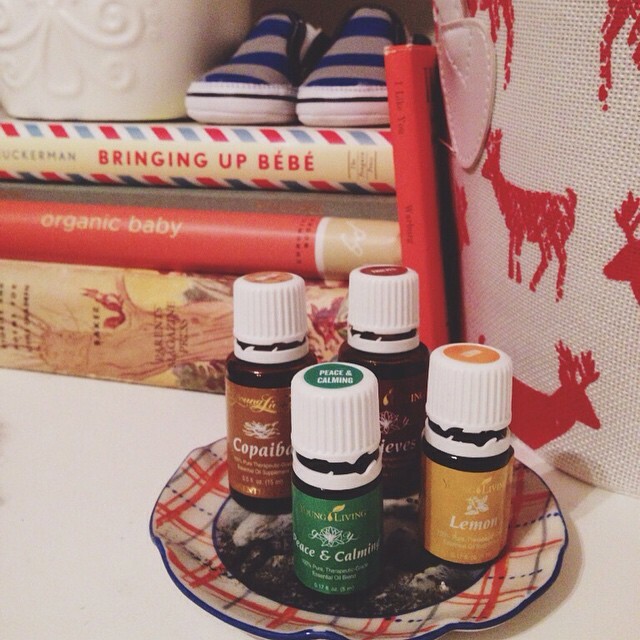 + The Young Living Kid Scents collection: Sleepyize, Owie (we use a lot of this lately! ), Snifflease, Bite Buster, and TummyGize. + Copaiba: a must-have for the early years! + RC: a must-have for the winter months, this blend stands for "Respiratory Congestion." + Purification: a main ingredient in our repellent, we also use this for respiratory support in the winter, and for a DIY room spray (love it on the dog bed!). This is a great alternative to those wall plug-ins that are unfortunately laced with formaldehyde. Our diffuser is constantly running, and this oil is our go-to. + KidScents Tender Tush: amazing ointment infused with essential oils that is great for skin support. + Rose ointment: another great one for skin support, we use this for making diaper cream, after-sun cream, etc. + Thieves spray + Waterless Hand Purifier: for being out and about and for all the things that get dropped on dirty floors. + Bamboo Diffuser: we splurged a little and got a second diffuser to keep in E's room, and it was absolutely worth it! This diffuser has a one or four hour setting, so I love putting just a few drops of oil in it and turning it on during nap time or before bed. + Gentle Babies : my go-to reference for all things pregnancy, baby and child! + A cute travel case for taking oils in the diaper bag. + Paracord bracelets work great as diffusers for older kiddos! And lastly, a completely superfluous item but one that has come in handy so many times, a diffuser paci clip, especially for long car rides and traveling! More information on essential oils here and here.